Is 2019 the year of Security Token Offerings (STO)? Over the past year, there has been a significant increase of token sales authorized by the United States SEC to sell securities to large numbers of investors, according to financial news channel MarketWatch. If this trend continues, startups may increasingly look towards STOs as a viable option to raise funds. 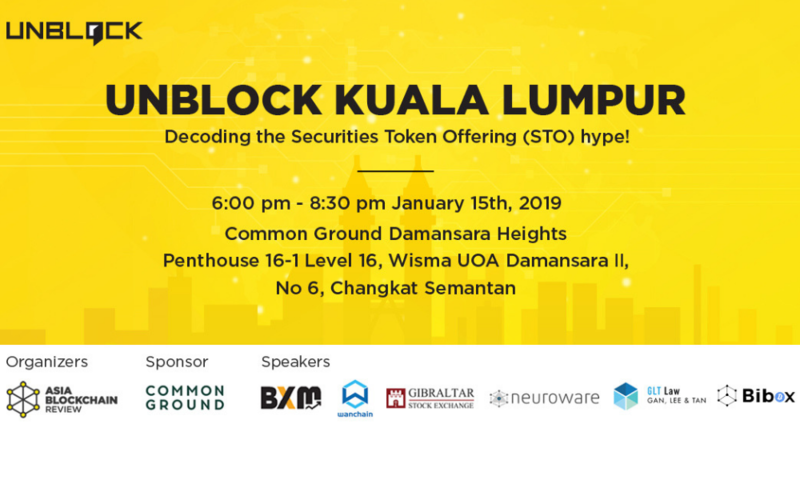 With this in mind, Asia Blockchain Review organized its third Unblock KL meetup on Tuesday, January 15, on the topic of “Decoding the Securities Token Offering (STO) hype!”. The meetup opened with a keynote presentation by Gibraltar Stock Exchange. VP of Partnerships Chuan Ji Lim took the stage to share his thoughts on the future of STOs. Lim opined that we need to think beyond efficiencies and cost if we want institutions to adopt Distributed Ledger Technology (DLT) infrastructure. Amidst the STO hype, we need to think about how security tokens can actually add revenue. While efficiencies and cost factor into institutional adoption, “nothing excites institutions more than making more money”, says Lim. Next, BXM and Bibox engaged in a fireside chat on challenges faced by exchanges in this persistent bear market. Since exchanges depend a lot on transaction fees for revenue, the drop in users throughout the past year has greatly impacted the bottom line of these exchanges. Furthermore, the Securities Commission of Malaysia announced on Monday, January 14, that unregistered exchanges would be subjected to a 10-year jail and RM 10 million ($2.4 million USD) fine. Exchanges that are not yet compliant would incur legal costs, or face the possibility of shutdown. Rounding off the agenda, Wanchain, Neuroware, GLT Law shared the stage to discuss how institutions can prepare for the future. These days, institutions face pressure from global uncertainty such as Brexit or the recent US government shutdown. In addition, technological advancements in areas such as 5G, edge computing and blockchain technology poses credible threats to slow-changing institutions. Speakers from the panel shared their experiences on best practices when navigating business complexities and prepare themselves for technological disruption.